To get electricity, we use oil and gas, but the combustion produce greenhouse emissions (CO2 eq. ), and this greenhouse emissions affect the temperature causing an increment, and the consequences are: Effects in cardiovascular, diarrhea, malaria, malnutrition and natural disasters. CO2 emissions increase at a rate of 2.1% annually. Currently, the average concentration level is 400ppm according to World Meteorological Organization. The EU power generation mix will change considerably in favour of renewables and there will be significant energy efficiency improvements. Energy poverty is the difficulty or inability to maintain the home in adequate temperature conditions, as well as having other energy services such as electricity, electronic devices or other essential services at an affordable price. To solve the problem of pollution, we must increase the % of renewable energy, which will mean an infrastructure investment. This means an Average retail electricity price steadily increase up to 2030 by about 18% relative to 2010 levels. Transmission and distribution costs increase significantly in the longer term, post 2030, party linked to the need to cater for the increased presence of renewable energies in the power generation mix. 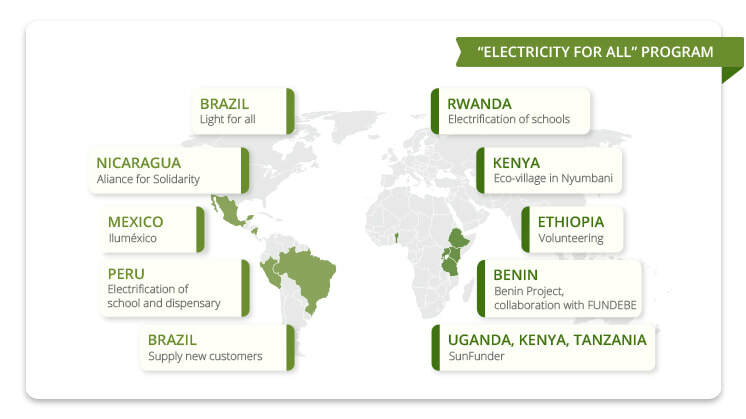 There are also foundations that use their resources and efforts to combat the problem of access to electricity. The electricity program for all of the Iberdrola Foundation, have achieved in 2 years, give access to electricity to 2,400,000 people.